Welcome to the first monthly column from none other than New Zealand MX legend BEN TOWNLEY. This column kickstarts BT’s Blog, which will see BT regale us with tales from his NZ adventures with this new tour company and his new direction which as he says focuses on one of three things . . . but read on for more! Stay tuned to ridektm.com.au on the first of every month for BT’s Blog. 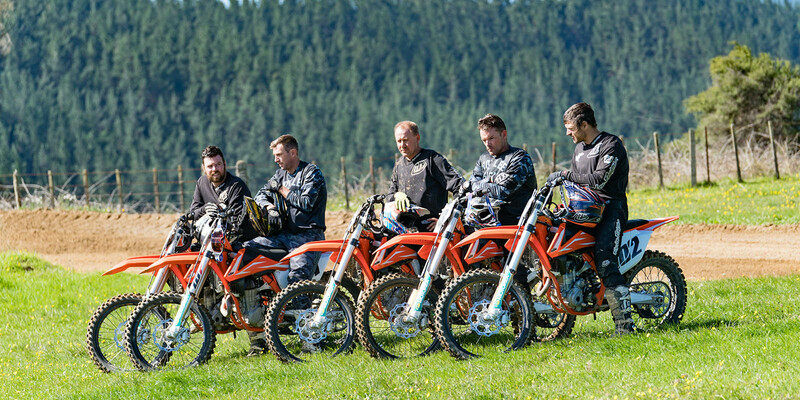 Welcome to my column here on ridektm.com.au, I’ll be filling you in on what I’m up to here in NZ while I’m either doing one of the 3 things – riding my KTM, hosting international guest’s riding KTM 350 SX-F’s or coaching kids on KTM dirt bikes ! If you know my history with KTM then skip the next paragraph, otherwise I’ll give you a little history lesson with myself and the Austrian brand. As a fresh faced teenager I race KTM’s in Europe for 5 years, 2001 through 2005 where I progressed through the ranks and won the 2004 World MX2 Championship on KTM’s first ever 250 SX-F, before graduating to the MX1 class in 2005 and winning a 4 of world championship rounds and finishing 3rd in the world. As I retired from professional MX racing, I’ve always had the desire to give international riders the opportunity to have a riding holiday in NZ with their mates and what better brand to do it with than KTM! Joining forces with KTM has allowed me to start this business venture with the ultimate bike for a tour option – the 350 SX-F! NZ has so many dirt bike riding opportunities, I am based in the Central North Island which has MX tracks and XC trails scattered all over the place within 1.5 hr’s driving distance. Probably the biggest benefit of the area is the soil, volcanic ash which makes up most of the central North Island is soft and loamy and allows for all year round riding. The tours will be based from a small lakeside village called Lake Rotoiti which allows short trips to and from the riding options, but allows guests to be nestled on the edge of a lake away from the hustle and bustle of a city. So I’ve formed “Ben Townley Tours” which offers riding trips of all descriptions, whether you only want ride for 3 days because you’re on a tight timeline, or get across for a whole week of riding, you might want to schedule in a race event while your here too or get some coaching, whether it be MX track or XC trail riding I can cater for what you want to do while your here. I named one of the tours “BT’s Ultimate” Tour because that would be an ultimate riding trip for me if I was wanting to go on a riding holiday with my mates. I’ve just finished an “Aussie MX Getaway” Tour which is a 3 day riding trip. My 4 riding guests were from New Caledonia, they arrived here on Friday evening and we hit the ground running on Saturday morning bright and early. They had researched the riding options and had requested riding the world famous Taupo MX track and also the Rotorua MX track. In this group I had 2 x Vet riders and 2 kids who were on a 85 and 65, they were all very capable riders and clocked up the hours over the 3 days ! One of their riding days at Taupo MX track were the days you dream of, there was plenty of moisture in the ground from rain the days prior and the day was bright and sunny making the track prime time! After taking them to their 2 requested tracks, the final day I showed them some footage of what I call modern day XC trail riding and they were keen to check it out for their final day riding. The loop is normally about 20-25kms, but had to be cut short due to rain damage in certain areas, I got a 15 min loop set up for the group early that morning and they burned through tank after tank around Burt’s Farm! The trails at Burt’s are bulldozed trails through pine trees, the team out here groom them every 2nd week, so there is no grovelling through mud or getting stuck on hills pushing your bike. All in all it was a great day for the group, they had never trail ridden before, it was cool seeing the smile on their face at the end of each riding session ! That’s all for my first column, I’ll be racing my 450 SX-F in the coming weeks which will be interesting. Go to www.bentownley.com and have a look at my tour options, click on enquire if you want to get in touch !